President Moon Jae-in's approval rating gained further ground apparently on his historic summit with North Korean leader Kim Jong-un last week, breaching the 70 percent mark for the first time in nearly four months, a poll showed Monday. In a survey conducted by Realmeter, 70 percent of 2,502 adults polled said they approved of the way the president managed state affairs, up 2.2 percentage points from a week earlier. The weekly survey was conducted Monday through Friday. The latest reading marked the highest since the second week of January when his approval rating stood at 70.6 percent, according to the local pollster. The on-week increase apparently follows the historic inter-Korean summit, held Friday at the truce village of Panmunjom, in which the leaders of the two Koreas agreed to completely denuclearize the Korean Peninsula and also halt all military provocations and hostile acts against each other. 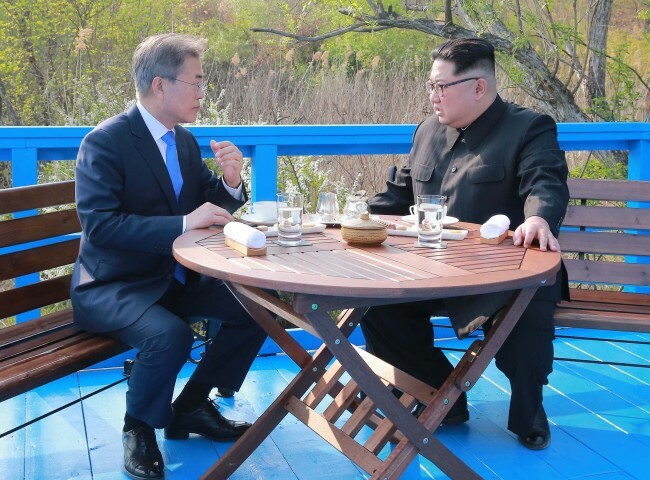 In a joint declaration, Moon and Kim also declared there will never be another war on the peninsula. Moon is set to hold a bilateral summit in mid-May with US President Donald Trump, apparently to discuss the outcome of his summit with the North Korean leader and give any useful information to the US president, who will meet with Kim later in the month or in early June. Those who disapproved of Moon's way of state management came to 24.4 percent of the total in last week's survey, down 3.0 percentage points from a week earlier. Despite the rise in Moon's approval rating, that of the ruling Democratic Party suffered a slight setback, slipping 0.9 percentage point to 52.2 percent, while that of the main opposition Liberty Korean Party dropped at the same rate to 21.1 percent.